We’re in a hotel on the edge of the central business district (written and pronounced CBD in Australian English, never spelled out, even on first use) in Brisbane. The CBD borders the Brisbane River and it includes various state buildings as well as commercial offices, stores, and hotels. Some years ago, the downtown waterfront, as in many cities, was entirely industrial and inaccessible to pedestrians. I haven’t researched the political process that led to the current situation. I imagine there was conflict in Brisbane as there is conflict everywhere when planners and developers want to displace businesses in favor of tourism. However, as a tourist, I can say that the effort paid off in spectacular results. The CBD is chock full of the sorts of building architects mostly dream up for competitions in the U.S., with no thought of ever being allowed to actually build them. Public spaces, including those in front of commercial buildings, are showcases for large, modern public sculptures, the result of a requirement that 0.25% of construction budgets be spent on public art. In the U.S., the one percent for art movement has not done nearly so much. 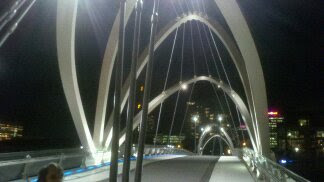 Pedestrian bridges seem to be a special art form in Australia. Here’s one that connects South Wharf and North Wharf in Melbourne (an area that includes a discount mall, a convention center, some casinos, and some pleasant walking paths along the shores but not much else to hold one’s interest). 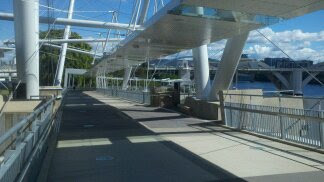 Here’s one of a much larger pedestrian bridge across the Brisbane River, a block from the hotel, although the photo does not really convey the dramatic design, I’m unhappy to report. Because the museums here are state-owned, admission is free. The one I spent the most time in, the Gallery of Modern Art, mounts a heck of a show. It is what the other end of the bridge connects to. Prices in general, at least in the CBD, are higher than I’m used to. Espresso shops are everywhere, and they are everywhere more expensive that Starbucks at home, by quite a bit. Coffee of the non-espresso type is virtually unobtainable. I’ve learned to order “black iced coffee,” which consists of a great deal of espresso, ice, and additional water to make the stuff drinkable. “Iced coffee,” in Australia, is a dessert drink consisting of two scoops of vanilla ice cream, milk or cream, and a little coffee. Not the same thing at all. Yesterday I toured the botanic gardens (42 acres, ten full-time gardening staff). The point of botanic gardens, as opposed to other sorts of gardens, was historically to have a place to test the suitability and economic viability of various plant species, both native, such as the still extant tree that produced the world’s first commercial crop of macadamia nuts, and alien, such as date palm and tamarind tree. The botanic gardens here date to the mid-nineteenth century. Many of the native plants on exhibit have common names similar to Northern Hemisphere plants but they are botanically unrelated or only distantly related. It is always interesting to see how biological niches get filled, though, one way or the other. On the way back from the garden to the hotel, I passed three or four barristers at the end of their day in court. They had on the starched white collar-type thingies that cross on the chest, the white dress shirt, and the lightweight black robes; they were dragging their large, wheeled briefcases behind them. They were a rumpled, bedraggled lot. Hard day in court, I guess. This morning, I chanced upon a couple of barristers on their way to court. They were freshly pressed and starched, their hair was kempt, there was a spring in their step, and they were carrying their wigs in hand. I got the impression they have several changes of their court attire and afford the nearby dry cleaners a nice livelihood. "They had on the starched white collar-type thingies that cross on the chest, ..."